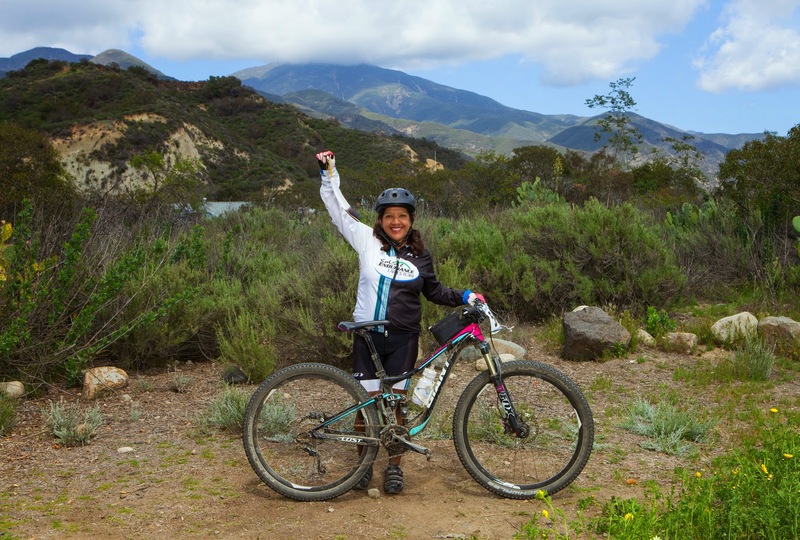 I started riding because of a pure passion to be outdoors and be adventurous. I'm an active member of the Trail Angels and Girlz Gone Riding. My plans for 2015 are to continue racing with a concentration on enduro. I will also be racing for The Path Factory Team. Other plans for 2015 include more relaxation and catching up on sleep missed in 2014. Outside of biking I make a living working at the Orange County Water District as Administrative Support Specialist to Hydrogeology and Health & Regulatory Affairs. I was previously in construction for 17 years. I am involved with the International Association of Administrative Professionals and hold the title as Board Secretary for my local chapter. I was diagnosed with Lupus in 2000 and have had few minor and not so minor complications. Mountain biking is my big middle finger to illness. Stay in touch on Facebook, Twitter, or Pinterest! I started riding about 10 years ago. But had the itch years before, I just didn’t know anyone who mountain biked. One day my cousin mentioned her husband came home with mountain bikes. Within a week, I went out to my local shop and bought my first bike, a Giant Boulder SE. While at the bike shop I picked up a flyer advertising a mountain bike class at the local community college for PE credits! I registered for that class. That introduced me to some local trails and some new riding friends. One of them is now married with kids to one of my best friends! Life! Different things have motivated me over the years….wanting to meet people (friends and boys), then subsequent riding to get over said boy (! ), weight loss, stress release, earning dessert. I can pretty much come up with any reason to motivate myself into a bike ride. 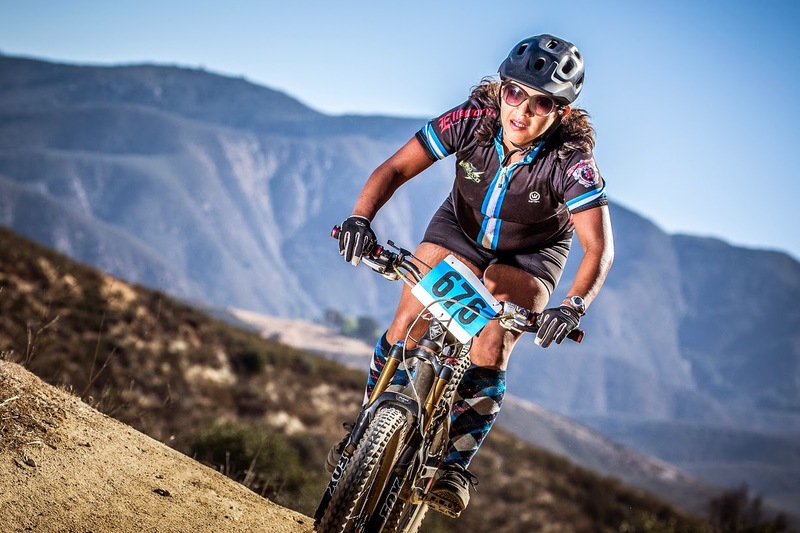 I have to say my favorite is the Southridge Series, I compete in Super D. It was my first mountain bike race and it’s like home to me. I had watched my then boyfriend compete there for years prior to trying it myself. I’ve made some good racing friends there. It’s the small community of people I look forward to seeing every winter when the series starts. I’ve never thought myself to be a competitive person but racing has awakened that side of me and I’m learning to embrace it. It’s given me confidence that I didn’t have before and it has spread to other areas of my life both personal and professional. I was naïve and thought it would be easy since I’ve always loved riding bikes. I even made plans to ride twice in one day! Oh the foolishness! My first official ride was with the mountain biking class, it went so well (not) that one of the guys had to push my on all the uphills since I was so weak. It was horrible. But I loved it. And on a side note that really nice guy is now married to one of my best friends. I’m a nervous Nellie. And 100% of that is in my head. I’m still fighting it every ride. I wish I had an off switch. Some of my best riding was during emotional times in my life. I had so much that I wanted to purge I just didn’t care or think too much about the trail. If anyone knows how to channel that during happy times I’d pay for that pill. I use clipless pedals on my XC bike and flats on my all mountain bike. I HATED them at first. I used them early on. I remember riding around in circles in my parents’ backyard. Then I tried them out on the trail. Everyone charged off and I tipped over and could not get back up, very frustrating. So I would say start in an area you are comfortable, and just ride around in circles, practicing clipping in and out until you are comfortable to try a longer distance. You will tip over; it’s part of the process. I had one bad crash years back that took forever for me to overcome. I was afraid of anything technical, I slowly got back on the bike but it took a while to get that trust back. Like the cliché….time healed that wound. When I first started riding I had little fear, it was the injuries and falls that taught me fear. I’m a work in progress, I always will be. I still struggle with steep sections. We all have our different fears and as long as it doesn’t keep you from riding then we are overcoming them. Switchbacks, right handed downhill switchbacks! It’s a weird mental block for me. Just keep at it. One day I will conquer it. As long as I keep moving forward then that’s all that matters to me. You plan to ride more enduro next year, tell us why you enjoy enduro! Enduro challenges all of your biking senses; endurance, downhill, and technical abilities are all put to a test. I have grown more in my skill set in the one season of enduro racing than in any other discipline I’ve tried. It’s exciting. It’s a little less intimidating than a cross country race where you are shoulder to shoulder with people. Enduro is just you and your bike and the trail. The atmosphere is social and supporting. What other styles of mtb riding do you like and why? I love a good long adventure ride. It doesn’t have to have any features so long as I’m out away from the world. I’m working on my DH skills. I’d like to learn to jump. Like any relationship spicing it up with something new is mandatory every few years. Freedom! It’s like going back in time and being a kid again. Riding fits all my moods. I currently have 4 bikes, my XC rig is a Giant Lust. I choose the Lust because it fit. Being 5’ it’s challenging to find a bike that fits. Giant has been good with sizing and their bikes need little adjustment for me to ride them and they’ve been great bikes (I’ve owned three Giants since I started riding and loved all of them). I also have a Pivot 5.7 that I use for enduro racing. This one took a few adjustments but it’s been a good bike and rides like a dream. I also have a Marin Treviso road bike and a beach cruiser. I’m short and most regular riding shorts fit me like knickers, which unless they really are knickers is just not cute! My favorite brand that works for my short legs is Zoic. I LOVE their shorts and have been riding in them for years. My jersey collection is across the board. I am a natural networker. With two large diverse groups you are never at a shortage of riding buddies. Plus I like to explore, I don’t mind driving an hour to ride at a new spot; having two groups in different geographical regions feeds that need. What do you feel are benefits of being involved with women riding groups? There is support, understanding, comradery to name a few. Don’t get me wrong, I ride co-ed most of the time but there are times when I just need a girl’s ride. There are just things a guy won’t get. And I don’t know about most people but I have a hard time learning from a significant other. No better way to start an argument. I love riding with women who take chances and pick good lines. Pick someone you want to ride like and follow them. A riding group is a good way to find your tribe or your riding bestie. If you ride with a group long enough you find a few special people to bond with. The trails are our schoolyard. Make friends and play! I also think it’s good to have options. Even when I ride alone, if I’m at a local trail there is a 90% chance I’m going to run into someone I know. Just saying hi and knowing people out on the trail gives me a warm fuzzy feeling. Men! No, I think it’s our own fears. We have a way of talking ourselves out of a lot of fun. I hear a lot of my friends who don’t ride say things like….’one day, when I lose a little weight, when I feel I’m in better shape, it looks like fun but I couldn’t do that, do I have to wear those funny shorts? !’ I have Lupus and when I had my first serious complication in 2000, I told myself I was done waiting for the perfect time. I wish I didn’t have to say it took a serious illness to get me out there but that was the catapult. I hope I can encourage women to stop waiting, take your leap! It doesn’t have to be mountain bike but find your thing that enriches your life. There have never been so many resources out there for women and it keeps growing. 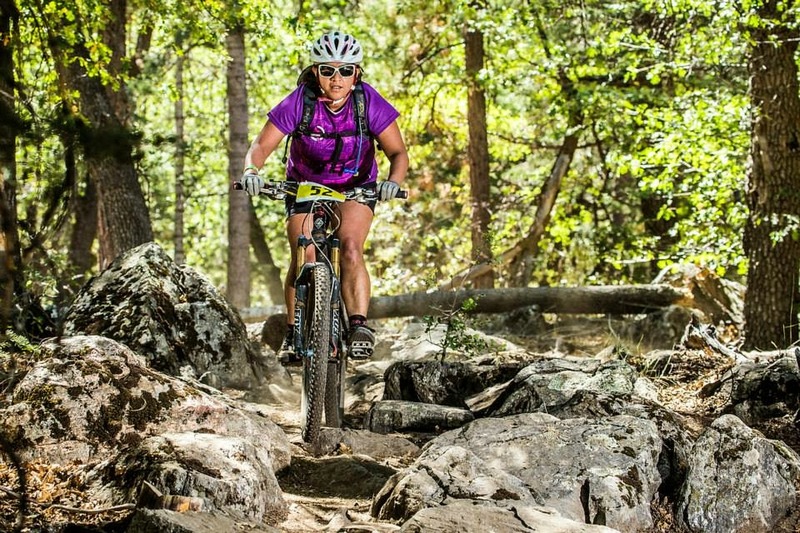 This is a very exciting time to be a female mountain biker. Find a beginner ride, or post your own ride. Be encouraging of ladies, remember where you started and don’t be overzealous that you might scare a newbie. I have so much fun doing what I do that I just want everyone to experience that joy. When people hear about my biking or racing they make me out to be some sort of super girl but I’m not!! I’m just like everyone else and just about anyone can experience this life. There is no magical formula except desire. I don’t know if it’s random but I have a mild obsession with goats and any type of baby farm animal.